Unbreakable, right-minded, sound relationships are imperative to we Humans flourishing. In everything we do. Our relationships in life, from fleeting to permanent, are the lifeblood of activity and progress. They are also the lifeblood of activity and retrogression. Whatever form that retrogression may take. 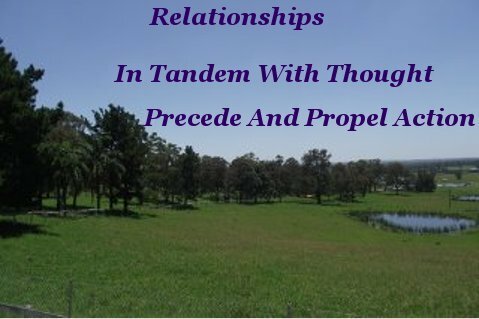 Relationships, in tandem with thought, precede and propel action. 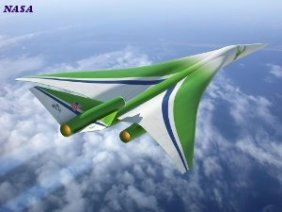 Without the ability to think, reason constructively, invent, and build, we would be tramping this planet naked, foraging for what ever benefit we could stumble upon. Or steal. Likewise, without the ability to think and reason constructively, sound relationships would be erratic, unpredictable and random. Uh oh, this feels familiar . . . Right thinking Humans build. Wrong-thinking Humans steal. And that difficult. Relationships are the meat in the sandwich. The pivot point for success, or failure. Whatever the endeavor. Our actions are totally reliant on our state of mind. We are all thinkers and non thinkers. Depending on the state of mind we choose at any given moment. To paraphrase Albert Einstein, not much happens without relationships. This applies with equal impact to business and political relationships as any other. All relationships are personal, separated only by degrees of intimacy. Building and maintaining rock solid relationships should be our highest priority. I served my apprenticeship with what was then known as the NZ Post & Telegraph, a Govt. owned and run monopoly. Anything to do with modern day telecommunications we did it. From digging holes for telegraph poles, to building a complete telephone exchange. A paradise for learning a diverse range of skills, it was here that I made my first acquaintance with Magnetism and Electricity. Not long after I started this iob we were in the countryside building a new telephone line to somewhere and I was atop a twenty five foot high pole with a senior tradesman I'll call Bob. We finished our handiwork and Bob tossed the tools we were using to the dusty ground. Unbeknown to him, our Foreman was not far away and he witnessed this action. He walked over and reproved Bob for mistreating the tools. Bob responded with, “I'm showing Bill what not to do”. Bob's answer may have been a repartee and amusing, but it holds more than a grain of truth. It really is important to know what not to do. Damaged tools are not of much use, neither are damaged relationships. 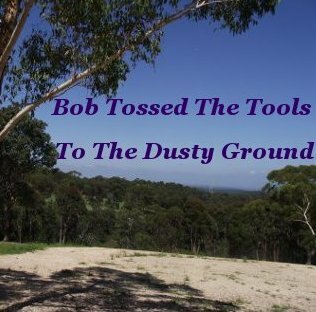 And just like Bob, an otherwise top guy, recklessly tossing tools into the dust, it is all too easy to carelessly toss a relationship into the dust, inflicting latent damage. The most important relationships are the ones we establish with ourselves by building a healthy self image and ego. Doing this places us on a solid footing to construct mutually beneficial and lasting bonds with Humanity at large. We have survived so far as a species despite the horrendous evil that has attempted and at times succeeded to dominate both the producers and the fruits of this commendable effort to not merely survive, but flourish. 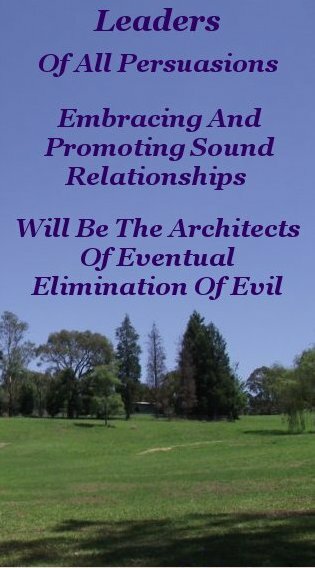 Leaders of all persuasions embracing and promoting sound relationships will be the architects of eventual abolition of evil. Are you happy with where the World is going? The direction our world is heading is still heavily influenced by practitioners of questionable moral behavior. But more and more people are being introduced to Personal Development and realizing by adopting and making it their own, they can make a huge difference. In their own lives and further afield. I feel confident that we can turn this planet around. And steer it onto a stable and sustainable course. This is why I associate Personal Development so closely with (applied) intelligence. We have ample potential intelligence right inside our heads. 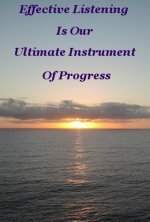 It is how we develop and apply that intelligence that dictates our future. Personally and collectively. Current conditions and our responses to those conditions create both our personal world and our future. Response, being key to influencing change within our inner world, and our wider environment, must be based in knowledge and executed with wisdom. Practicing exemplary moral behavior while building, enhancing and strengthening sound relationships, will set the necessary standard others will be inspired to follow. Facilitating our responses, practising Personal Development addresses and improves those aspects of our own inner Human machine that enables one to perform on a progressively higher plane of Thought. While at the same time it identifies, reduces and eventually eliminates those aspects that restrict and restrain higher plane performance. These aspects to be eliminated are the misuse of our negative emotions. Those brazen, flagrant, sponsors of undesirable traits such as greed. Higher plane performance utilizes qualities that counter and neuter greed and it's implicit violence, whether it be physical or psychological. Qualities that deliver peace, prosperity, and abundance. In an equitable, sustainable manner. Creating a salutary for all, world. 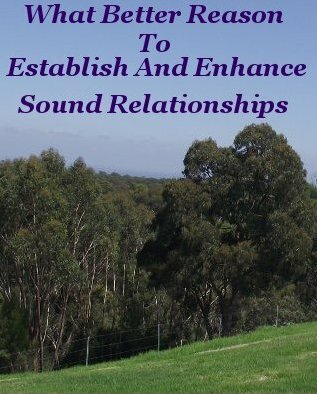 Is there a better reason to establish and enhance sound relationships?